To wear Jason Wu (again) or not to wear Jason Wu. That was the question on Michelle Obama‘s mind pre-inauguration. 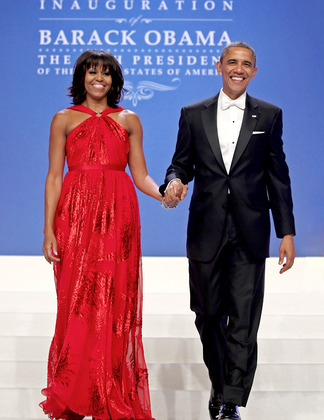 In 2009, the First Lady wore a white, one-shoulder gown by Wu to the Inaugural Ball, catapulting the designer to fashion stardom. Four years later, Wu again worked closely with Mrs. Obama’s team, yet there was no confirmation as to whether or not she’d remain loyal. As America watched her take the stage, the Twitter community exploded, starting with Wu’s shocked tweet. As for the rouge number’s next destination? Off to the Smithsonian! Mickey Boardman ‏(@AskMrMickey): It’s INSANE how worked up we all are about FLOTUS’ dress! Mrs O is the biggest thing to happen to fashion in DECADES. Amy Odell ‏(@amyodell): MObama in red floor length gown. Let’s all go home now!! Phillip Picardi ‏(@pfpicardi): Also re: inauguration outfits/couture… can the fashion community please stop ‘dying’? Over everything? Bergdorf Goodman ‏(@Bergdorfs ): and ps – let’s have a big glorious ruby red hive five for @JasonWu ! second time’s a charm, m’dear. Not Bill Walton (‏@NotBillWalton): CNN is going nuts over Michelle Obama’s dress. I had to make sure I wasn’t watching The Chris Bosh Show on Bravo. Oh, the humanity! …For the full scoop on Wu and The White House, check out this morning’s Today Show interview.